I love a good ghost story. As a child I was the one everyone looked to as we sat around the campfire. Blessed with a most active imagination, I would spin a scary tale sure to keep everyone up all night. Hope you enjoy this little story as you venture out to ‘trick or treat.’ Enjoy! And Happy Halloween. Eugene eased his make-shift hoe next to the large round pumpkin, careful not to snag anything he shouldn’t. He clipped the stray weed invading his patch and leaned back, his chest puffed out with pride, thumb hitched in the frayed rope he used as a belt. Any time now, the Governor was bound to drive by. as a ghost, her long skirt billowing about her legs. “No! Stop!” Eugene yelled and threw up his arms. She was rushing right toward his pumpkins. No telling what kind of damage she’d do. Willow continued running, staring back into the trees lining the patch. She shrieked again, but her voice cut short as she crashed to the ground, her black boots entangled in the prickly pumpkin vines. Willow jerked to stare at Eugene. “What?” She pushed herself up, staring back at the woods. “But something is...” With a sickening crack, she stepped on a thick pumpkin vine, breaking it in two. “I, I don’t have any money,” Willow croaked, trying to pull her arm free of Eugene’s vice-like grip, her eyes still flitting about the trees. Eugene stared up at the inky blackness within the heavy branches. He shook his head. Crazy fool kids. Just like their parents. What was it with the people of Burberry spinning all these crazy stories of some durn monster terrorizing the hills? They just wanted to make trouble for him, prevent him from providing the Governor with the best crop of pumpkins ever. Willow took one last look at the woods and dashed off, heaving through the tall grass and jumping over the small creek at the edge of the meadow. Eugene watched her disappear around the bend in the dirt road, her long hair streaming behind her like a flag. “Stupid girl,” he spat and returned to his pumpkins, fussing over the crushed leaves, trying to splint the broken vines. It just wouldn’t do for the Governor to see this. He raised a bushy eyebrow at the orange goop surrounding the broken pumpkin. At least she’d managed to destroy a spoiled pumpkin. He turned is so the Governor wouldn’t see. Branches rustled from within the trees. Eugene looked up, expecting a gang of ruffian Burberry boys to come blaring out, a hooting and a cackling. No one appeared. Only the oak’s leaves quivered in the hush of the nearing dusk. “Dang hoodlums.” He’d give them what-for. “Come out here, you durn kids,” he yelled at the trees, shaking his fist. “George? Lucas?” he called, the hard edge gone from his voice. A growl drifted out from the trees. “Come on out, boys.” Eugene cleared his throat, trying to hide the shaky vibrato. The talk of the townsfolk skittered through his head. A demon. Flying monster. Dragon. Eugene swallowed. It couldn’t be. There was no such thing. Was there? The growl came again. Louder. Closer. Eugene stepped back, cringing as he snapped a pumpkin vine with his heavy work-boot. The shadow shifted in the trees, even darker as the sun waned beyond the horizon, bathing the patch in an orangey glow. Red eyes appeared from within the trees, staring harshly at Eugene. The shadow moved again, the ground trembling. Eugene’s knees quaked and he leaned against his hoe to keep from falling. Eugene jumped as a terrifying screech filled the evening air, like a thousand cats being skinned alive. The smell of sulfur and smoke stung his senses, singeing his nose and burning his eyes. He glanced about, but there was no place to hide. His shed stood a good quarter of a mile away. The only thing between him and safety was his pumpkins. wings like a giant bat, the tail of a lion, and its head…a grotesque square with red eyes, fangs and horns. As gross as it was, it was strangely familiar. Eugene’s heart quickened. The monster was coming…straight toward him. He’d be sliced to ribbons and chewed up like a lamb chop. He rested a hand against the pumpkin to try and stop his trembling. Was he not to see his award for his pumpkins? His pumpkins! He glanced back to the beast. It would easily crush his crop. And the Governor would pass him by again for Josiah. Eugene’s blood boiled at the thought. Gripping his hoe, he burst out from behind his pumpkin and charged toward the creature. fear clawed at Eugene’s belly again…until the beast slashed at the closest pumpkin, ripping it open, from top to bottom. That was all Eugene could take. He raised his hoe, and rushed the monster, swinging the sharp edge at the beast’s throat. The monster screamed as the blade connected with its neck, slicing the black skin, spattering dark purple blood across the pumpkins and vines. The creature staggered backward, swinging its grotesque head from side to side, its cry echoing into the growing night. With the sound of a tree falling, it collapsed at the edge of the pumpkin patch, the red glow fading from its eyes, frame stiffening to a hard gray. to profess him a hero! The Governor too. Smiling, he examined the monster’s head, searching his memory for where he knew it from. As if struck by lightning, it hit him. He’d seen this creature on top of the Magistrate’s. It was the stone gargoyle. 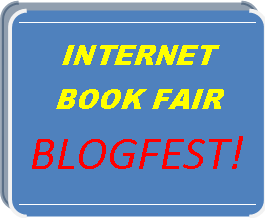 Internet Book Fair Blog fest - October 25, 2011! We see book fairs in schools all the time. Well, there's no reason we can't have a Major Book Fair on-line -- Virtually! Join us as we present bunches of books for your liking. Shop to your heart's desire! I’ve always loved picture books. I spent many a night reading these lovely tales to my children, enjoying the beautiful illustrations and relishing th. Today, it’s my honor to bring to you Ellen Jackson. Ellen is the award-winning children’s author of more than 55 fiction and nonfiction books for children. She was a Psychology/History/Philosophy major who graduated with a B.A. in English (UCLA), Teaching Accreditation (UCLA), and later acquired an M.A. in Counseling (California Family Study Center) with a specialty in early childhood development. She’s worked as an elementary school teacher, curriculum specialist, curriculum author, editor, and award-winning author of children's books. Her nonfiction picture book, TURN OF THE CENTURY, received a starred review in Kirkus, a pointered review in Booklist, was named a Booklist Editor’s Choice and was short-listed for the Texas Bluebonnet, Charlotte, and Children’s Crown awards. Ellen currently lives in Santa Barbara, California, with her family and enjoys hiking, beach combing, reading, playing Renaissance music with a local music group, and doing volunteer work in the community. To learn more, visit Ellen’s webpage at: www.ellenjackson.net. Welcome Ellen. Can you tell your readers something interesting about yourself and/or your favorite character from your new book, THE BALLAD OF BOOSTER BOGG? I’ll start with myself–and I’ll tell you a ghost story because you’ve written a book about a ghost (and because it’s October). Neither my husband nor I really believe in ghosts, but we’ve had some strange experiences in our current house. For about ten years, I’d hear strange noises, footsteps on the roof, and once there was an explosion in the kitchen. Also, the rocking chair in the living room would sometimes rock by itself. Another time, our shed was mysteriously locked–and I was the only person who had the key. My very skeptical husband, at first, thought I had an overactive imagination when I’d report these things–until he heard and saw them too. Even our stepdaughter heard the noises, so I know it wasn’t my imagination. A few years ago, all the strange occurrences stopped. Nothing unusual has happened since. Was it a ghost? Was it something else? I guess we’ll never know. That’s both creepy and intriguing! (smile) Now tell us about the main character in your newest book, THE BALLAD OF BOOSTER BOGG. The story of Booster is based on the life of a real dog who lived in a small town on the east coast. The real Booster was a beagle and his name was Boozer (can you guess why I changed it?). My wonderful illustrator, Christine Mannone Carolan, chose to depict BOOSTER as a big, goofy white mutt. I think it was a brilliant choice, and Booster, the character, is quite lovable. He sounds delightful. Did you have a favorite book as a child? Tell us about it and how it affected you as a person. I’m not sure I can name just one book. I read everything I could get my hands on when I was a child. My mother was a children’s librarian who worked for Walt Disney Studios, and she’d bring home all kinds of children’s books–from the Mary Poppins series to the Freddy the Pig stories to Dr. Doolittle and all kinds of others. That’s exciting. I bet you always had tons of great children’s books available then. So, how did you start writing for children? I loved to write when I was a child, but my mother discouraged me from becoming a writer. She wanted me to train for something practical–so I became a teacher. I read books to my class every day, and I kept thinking, "I could do that." Eventually I moved to a town where jobs were scarce. No problem–I decided (sorry Mom!) I’d just make my living as a writer. I wrote a picture book that I thought was a work of genius (it wasn’t). I worked and worked on the manuscript and probably rewrote it fifty times. While working on book number one, another idea occurred to me. I wrote book number two in about fifteen minutes, and sent the first draft off to five different publishers. I also submitted it to a writing class, where the teacher tore it apart in front of everyone. I totally lost interest after that, but one of the publishers actually bought it. That manuscript, THE GRUMPUS UNDER THE RUG, was in print until this year and has done very well. Love the Title. What’s the best part about being a writer? My books have won many awards, but the most satisfying part of being a writer is to get a heartfelt letter from a child. Sometimes I get letters that were "assigned" by a teacher, and these are not the letters I most enjoy–although I try to answer every letter I get. But when I get a letter from a child who honestly enjoyed one of my books–there’s no better feeling. To me, that’s the best part and it’s worth more than all the awards and recognition from adults. I have to add, though, it’s also been personally satisfying that I’ve managed to make a living as a writer. What’s the most difficult aspect of being a writer for you? Writers need to keep coming up with new ideas, new stories, and new angles on old topics. For example, there are currently more than 300 books for sale on Amazon.com about elephants. If I wanted to write a book about elephants, I’d have to think of something new to say about them, something no other writer had said before. That’s not always easy. Or if an author is going to write a detective story, she has to think of a new way for the detective to solve the crime. Coming up with new ideas for every book or story can be hard work. That is a very interesting thought and it’s very true. What advice can you give our readers regarding the writing process? I think that children’s writers need to remember what it was like to be a child–the smells, the tastes, as well as the fears and the misunderstandings that kids have about the adult world. Some of my best ideas come from my memories of how children think. For example, I recently sold a manuscript based on my childhood take of geographical names. As a child, I thought that Death Valley was full of skeletons and that Orange County was inhabited by lots of orange people. I took the core of this idea and expanded it into a picture book, THE SEVEN SEAS, in which I imagine seven seas, each a different color. This may seem outlandish, but there really is a Red Sea, a Black Sea, and a Yellow Sea. That’s an interesting way to take the book. Regarding publication and marketing, what advice can you offer aspiring writers? Read lots of books in whatever genre you’d like to pursue. See what other authors have done. Then try to come up with an idea or theme that hasn’t already been covered. It should be a plot, story, or idea that would interest your targeted age group. Then write the story, rewrite it again and again, and get lots of feedback from others. You may have to submit your manuscript over and over before you can break in. It’s not easy to get published these days. Persistence is key. Excellent advice. Now, how can your fans find, follow or friend you? Thanks so much for joining us today, Ellen. I appreciate your taking the time to be with us today!